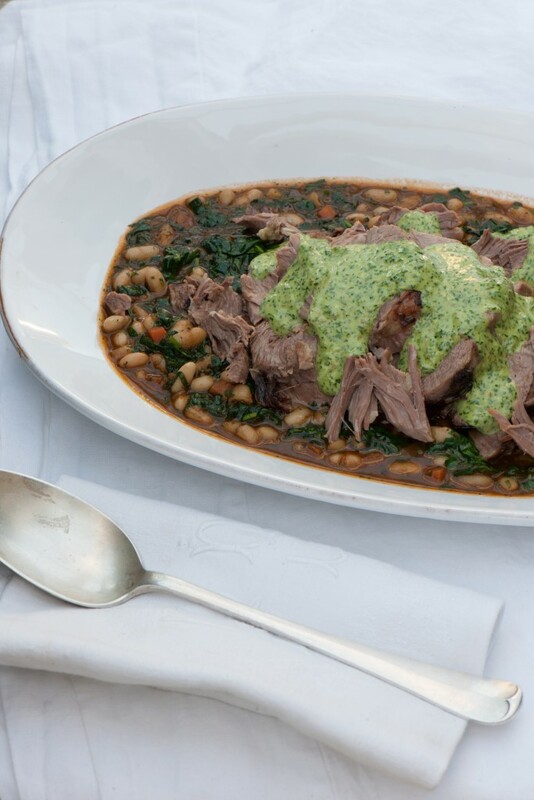 We chatted to Daylesford Farm’s Head Chef Gaven Fuller about his favourite recipe for Easter (we’ve got some easy Easter favourites of our own) and he let us into the secrets behind his slow-cooked lamb shoulder with white beans and salsa verde mayonnaise. We’ve got Gaven’s lamb recipe for you so that you can make it at home and impress your family and friends this for Easter. Daylesford Farm is situated in the stunning Cotswold countryside and the award-winning cookery school is the perfect place to gain culinary inspiration and confidence. All ingredients used at the school are sourced from the 2,350 acre organic estate, so things couldn’t be fresher. Head Chef Gaven’s favourite Easter recipe is a ‘lovely, rustic, slow-cooked and warming stew that really showcases the lamb’ and the school’s start-of-the-art facilities and best techniques for recipes and making use of seasonal ingredients enables him to do just that. Gaven reveals the best way to cook his favourite Easter recipe that is guaranteed to leave your guests feeling full and impressed! Mix two tablespoons of oil with garlic, thyme, salt and pepper and then rub the mix all over the lamb. Leave to marinate overnight in the fridge. Soak the beans in cold water overnight and then drain the following day. Preheat the oven to 160 °C/gas mark three. Heat some oil in a casserole pot (one that has a lid), put in the lamb and brown on all of the sides, then lift the lamb out and keep it to one side. Add the carrots, onion and leek and cook over a low heat for five minutes, until the vegetables have softened but are not coloured. Add in the tomato purée and the red wine and bubble up to reduce the liquid by half. Return the lamb to the casserole and add the stock. Pour in enough water to cover the meat and then bring to a simmer, cover it and put into the preheated oven for about three hours or until the lamb is very tender. Lift out the lamb from the casserole and keep to one side (reserving the cooking liquid). To cook the beans, heat the butter in a large heavy-based saucepan. When it’s foaming, add the onion and garlic and cook gently for five minutes or until the onion is translucent. Add the carrot and the drained white beans and strain in the reserved cooking liquid from the lamb. Bring to the boil, then turn down to a simmer for 30-40 minutes, stirring occasionally, until the beans are tender (you may need to top up with a little water from time to time). Remove the beans from the heat and stir in the herbs and chopped spinach. Taste and season as necessary. Return the cooked lamb to the pan over a low heat until heated through. To serve, lift out the lamb and slice into four. Spoon the beans and sauce into a warmed serving dish. Arrange the lamb on top and drizzle with a little olive oil. Serve with a bowl of salsa verde mayonnaise. Mix all the ingredients apart from the mayonnaise in a bowl and leave to stand for 10 minutes to allow the flavours to infuse into one another. Blend the ingredients to a coarse paste (or do this with a pestle and mortar). Put the mayonnaise into another bowl and slowly whisk in the blended herb mixture, a little at a time. Do this slowly, to avoid the mayonnaise separating. Watch this video to follow Daylesford Farm’s Head Tutor Steve Brown prepare and cook the delicious lamb Easter recipe step-by-step. Images and Video: Daylesford Farm and RLD.